Blend in, but stand out. The magnetic Portable Contour & Concealer Brush 150 attaches to its perfect partner—Match Stix MATTE Skinstick—so you can correct, conceal, contour or simply touch up wherever, whenever. For the most impact, apply Match Stix MATTE Skinstick directly on your face and blend with brush. For a softer look, stroke brush over product first, then blend as desired. 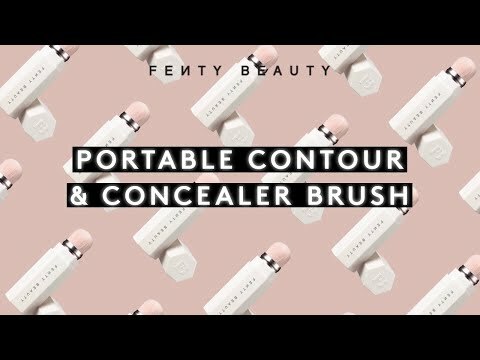 Portable Contour & Concealer Brush 150 is rated 5.0 out of 5 by 3. Rated 5 out of 5 by Alisha from magnetic i love that these brushes are magnetic and easy to carry around. it blends the cream contours and highlights very nicely. Rated 5 out of 5 by Ra from Underrated!! I cant believe how underrated this is! I tend to travel a lot and this is the best tool to carry if you touch up often while you're out. Love the softness of the brush, great quality and packaging.